The Waikīkī MLCD is located at the Diamond Head end of Waikīkī Beach. There is limited parking in a small parking area by the Waikīkī War Memorial Natatorium. Street parking is available along Kalakaua Avenue. City buses also serve the area. The MLCD extends from the groin at the end of Kapahulu Avenue to the ewa (west) wall of the Natatorium, from the highwater mark seaward a distance of 500 yards or to the edge of the fringing reef, whichever is greater. 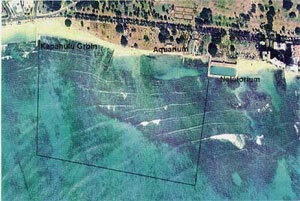 A reef flat extends out from the Waikīkī Aquarium seawall a distance of about 35 yards to a dredged channel, then continues on the other side of the channel. Most fish in this area are found along the channel’s shoreline side (which has a number of small caves), along the Natatorium wall, and near the exposed parts of the reef on the channel’s seaward side. The channel itself is about 8 feet deep, and depths above the reef flat are generally less than 3 to 4 feet. The reef flat throughout the MLCD consists mostly of rubble and coralline algae with some small patches of live coral. Sediment covers the bottom, so visibility is best when there is little or no wave action. Most of the reef flat has little bottom relief, and fish are more concentrated in areas where relief increases somewhat. At the outer edge of the reef the bottom drops off sharply to about 15 to 20 feet. Numerous arches, crevices and other features are found here, along with an abundance of fish. Summer swells frequently bring high surf to the southern shoreline. Waves are particularly dangerous at the outer edge of the reef, where parts of the reef are exposed. Lifeguards are on duty year round on the beach at the Waikīkī end of the MLCD. Restrooms, showers, emergency and pay phones, snack bar. With a permit to engage in activities otherwise prohibited by law for scientific, propagation or other purposes. To fish for, take or injure any marine life (including eggs), or possess in the water any device that may be used for the taking of marine life.